Mystery Fanfare: Philip Kerr: R.I.P. What incredibly sad news. Philip Kerr, author of the Bernie Gunther novels, died at the age of 62. I just started his latest book. What an amazing writer. What a loss. 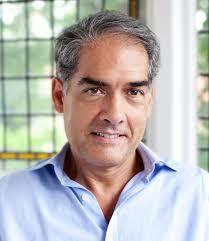 Philip Kerr wrote historical fiction, children's books and non-fiction. I loved the Bernie Gunter novels and his stand-clones. He will be missed. His death on Friday was confirmed by his publisher. Tributes poured in on social media for the award-winning author who penned a series of historical thrillers set in Germany during the second world war and cold war. Kerr, who wrote more than 30 books, including 12 Bernie Gunther novels as well as standalone thrillers and non-fiction, was married to fellow novelist Jane Thynne, with whom he had three children. Edinburgh-born Kerr studied law at university before working as a copywriter at a number of advertising agencies including Saatchi & Saatchi. He is said to have spent much of his time in the job researching an idea for a book about a Berlin-based policeman. Following several trips to Germany his first novel, March Violets, was published in 1989 and Bernie Gunther was born. .
Kerr went on to trace the career of the tough-talking detective from 1930s Berlin through the horrors of the Third Reich, into the post-war era and to the cold war. He also wrote the Scott Mason novels and a number children’s books under the name P B Kerr including the Children of the Lamp series. so so sad and sorry to hear. He was one of my favorite writers and Gunther one of my favorite characters. Deepest sympathy to his wife Jane Thynne, also one of my favorite writers. I am beyond words. RIP You will be greatly missed. Very definitely a great loss. While interviewing him a few years back he dropped, in the middle of things, the opinion that the rise of Nazi Germany was the most significant event since the Reformation! Took me a moment or three to process that, but on reflection I had to agree. His books are a treasure, and transcend crime fiction.